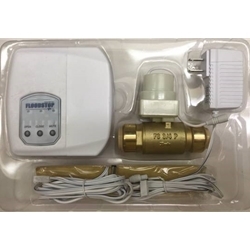 The FloodStop (FS 3/4-P) kit automatically shuts off the water supply to the Water Heater and sounds an alarm, leaving all other household fixtures and appliances operational.Powered by AC adapter/Transformer and 4 AA Batteries as a battery backup in case of a power outage, or the batteries may serve as the sole power source if there’s no nearby electrical outlet to utilize the transformer. The controller will beep to alert you of low or no batteries.One output contact (normally open) available, which allow the Controller to connect with Alarm, Home Automation or Auto-Dialer systems if desired. Easily installed in fifteen minutes. 1-Year Manufacturer's Warranty. The FloodStop Water Heater models can also be used on main water supply for the whole house as long as the size of the FloodStop is equal to or greater than the size of your main supply. Additional Sensors can be added by wiring one sensor to another in a chain format. There is no max # of sensors; however you will want to use a larger gauge (20AWG or larger) if splicing more than 50 feet to the furthest sensor. The FloodStop valve is installed between the Water Heater and its manual shutoff valve. UPC listed Full‐Port Motorized Ball Valve: CNC machined. Motorized Ball Valve: CNC machined with MIP X FIP. Rated 0‐180 PSI. Max 250 PSI. Solid brass. AB1953, UPC, CUPC, NSF61 cert. Sensor: 1.25 X 7.5 inch, double sided. Additional sensors may be added in series.